That's me after feeding the birds and watering the garden. I overslept, couldn't get to sleep last night so I got up and knitted until 3. So sleeping in until 10 was not out of the question, but I did feel guilty about it. Why is that??? Got out to start watering about 11 and since the water restrictions are in effect and it was after 10 I could only water holding the hose or using a bucket and that took a long time out there. There is a chance of rain tomorrow...hahahahahaha that is such a joke. Several areas around us got rain and hail yesterday afternoon. We heard thunder, the breeze picked up a bit and blew those beautiful dark clouds over us and away. Rain or not the temp it supposed to cool down into the mid-80's so I will be getting up early and play out back for a while. Randy spread sulfur on the yard yesterday hoping to take care of the bugs that consider me their "meals on wheels" delivery. 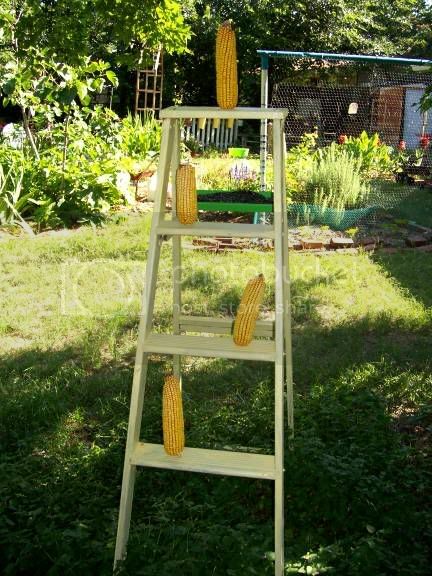 I did get the other two ladders I was offered. 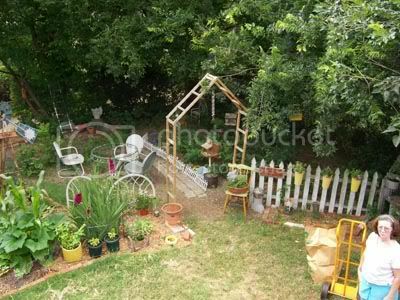 I need to get the tall one painted and placed out where the Cypress Vines are getting longer and longer and twinning themselves around everything else. Also got the wooden birds my Dad made painted and will get them on that hard to describe pool equipment stand, put it out back and take some pictures. Randy got up on the roof this morning to take the pictures. My makeshift potting area next to the shed. 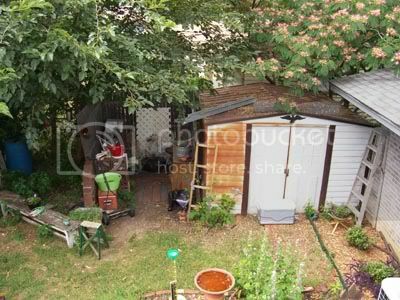 Just one of many as yet undone projects is to paint that shed. This started out with the birdbath and an 18" tall dwarf hollyhock 5 years ago. 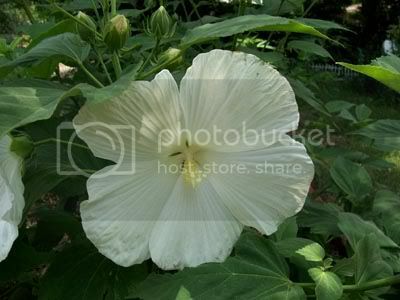 The white hibiscus is beginning to open it's blooms. It was difficult to hold that ruler in the right place and take a picture, in the bright sun that prevented me from seeing anything, anyway. This bloom is 8" across. 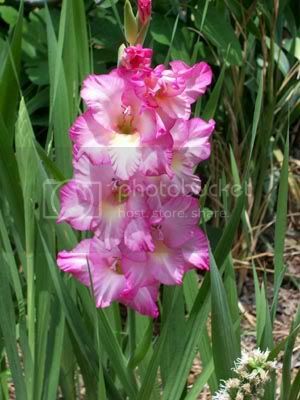 One patch of Glads are begining to bloom too.....at least a month early thanks to the early heat we have been stuck with. Can you tell I have a new camera? Got a good deal on a better digital and boy am I having fun taking much better pictures of things in the yard. 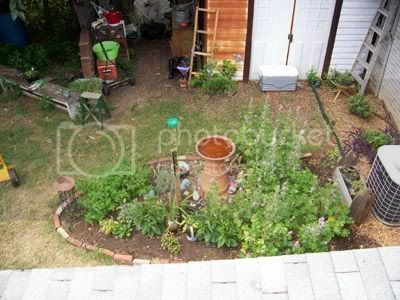 I will be chasing Randy up on the roof soon so he can get a good overall picture of the whole garden ....hopefully. the holy tree is growing there"
Looks like I will only be getting one of the ladders afterall. The other lady forgot to put them out for us to pickup this afternoon and it is just too far to make another trip for them. 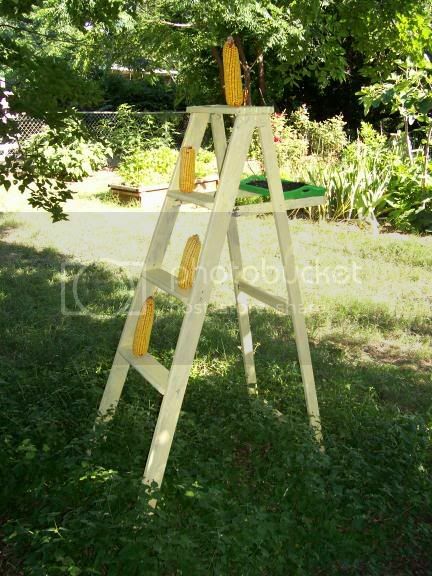 Dried corn on the cob on spikes on the ladder steps and where the old paint can holder used to be is a small green tray with sunflower seeds just for them. 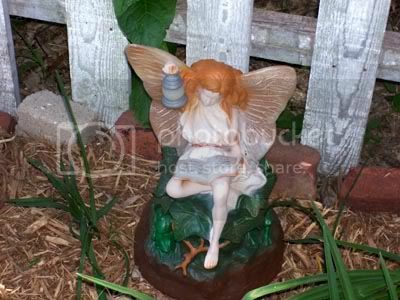 I painted it the same pale yellow as the fairy chair and put it in the middle of the Horseherb bed. 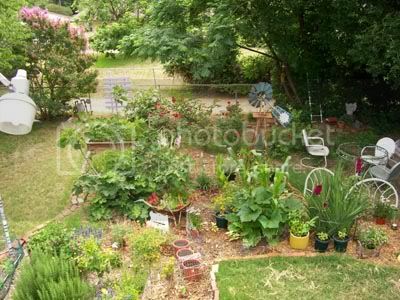 For months I have been looking at the bed around the hibiscus and saying "someday" I will expand that area since they are getting sooooooo big. Today I started weeding around them, one thing led to another as those things are want to do in the garden and before I knew it the whole 12foot long bed was 1 foot wider. Those babies come back bigger and bigger each year and it looks like this will be a banner year for blooms. Since we basically had no winter, they are already covered with buds and that usually doesn't happen until late June. I have two, a red and a white. The second spring they started growing I was really afraid someone driving down the alley would think the white one was a "pot" plant, the leaves looked very similar. Course some of our neighbors are the sort that would start picking the leaves instead of calling the narcs. I can hardly wait until they start blooming so I can take pictures for you all to see. 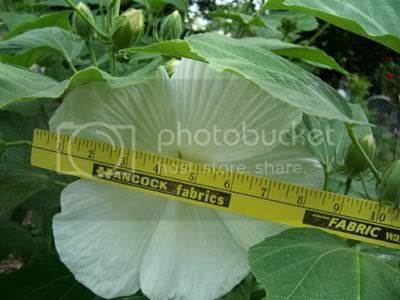 The blooms are usually 8-12 inches across. Does it ever really come to an end? Just when I think I have it all done and can sit back to just enjoy it with only doing a little weeding now and again....I think of some other garden area I want to create, find another plant or bunch of plants I want or find another piece of junk to turn into garden junque....and that requires a special area too. There really is no more space for plants....at least until I give the ones out there a chance to grow and see how full they get. 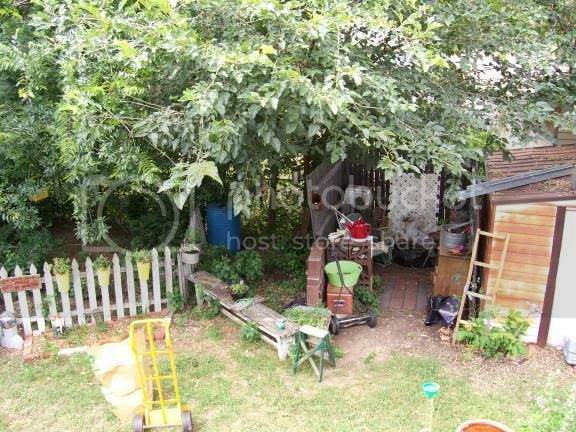 And no place for more garden areas until we get some trees trimmed back and a couple of dead ones taken down. (that is our job for this weekend) Both the peach and the redbud are almost 30 years old. The peach tries every year, it blooms and sets some fruit but they drop off before reaching marble size, then limbs start dying. The redbud didn't even come back this year. Those areas will still be pretty much shaded by the hackberry tree. 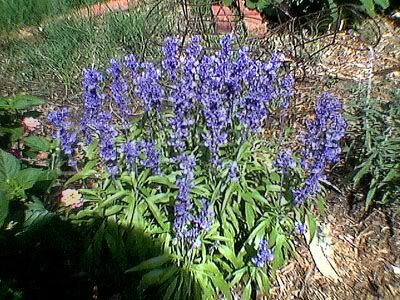 I already have some Horseherb out there and would love to make a shade garden with lots of Hosta, Ferns and Impatients. As far the garden junque.....I found a thing that was just way too cool to let the trashman take away a couple of weeks ago. 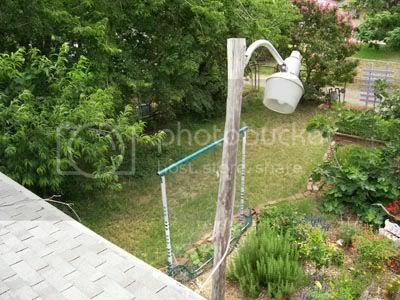 We think it had been used by the neighbors to hold pool cleaning equipment. It is two tall shutters at a 45degree angle on a base. Pictures will be forth coming when I am finished with it. I am painting those wooden birds I mentioned in another blog entry that my Dad had made many years ago...they will be hung on it and it will stand in a bed area right behind the house. I also posted a Wanted on the rEcycle list I own asking for old, wooden, rickety ladders. I was given one this week and we are picking up two more tomorrow. One will be a squirrel feeder.....on the other side of the yard from the bird feeders so maybe they will leave the birdseed alone....I can dream can't I? The other two will become trellis', one for a Cypress Vine I found coming up in the middle of the Mint Marigold, the one I had in that spot 3 years ago reseeded and they are just now coming up. The other one I will come up with something to use it for later. See what I mean!!!! And I haven't even started on the front yard yet. ...they kept grabbing onto my hat, my shirt, my shorts and anything else I let get within a couple of inches of them. 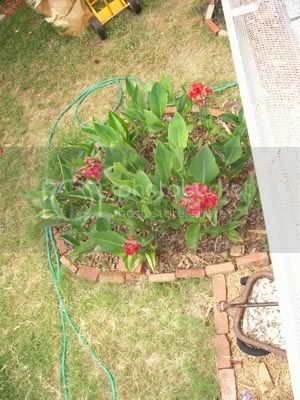 I started working on extending the garden to include the rose bushes a couple of weeks ago but found a really large fire ant bed....put some killer on it and noticed this week that they were gone. 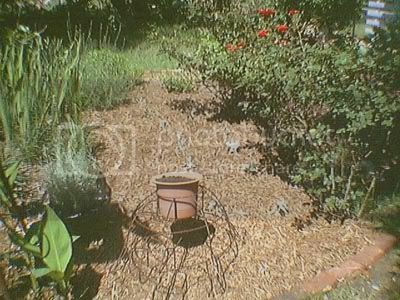 I will have to work on the other side of the roses, about half finished digging then will mulch it too. If my camera was better you could see that I planted Dusty Miller in front the roses. And the odd looking thing at the front of the picture is a turtle form my oldest daughter bought me for Mother's day last year. I have a chocolate vine that is languishing in a spot that is too shady, it will be transplanted to the pot in the turtles back and hopefully will cover the form before long. 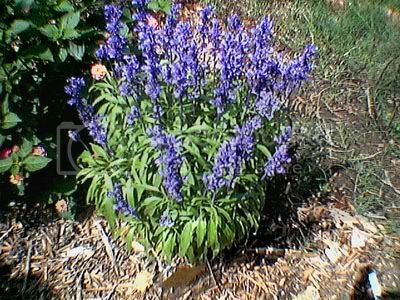 I wish I had a better camera to capture the really outstanding blue color of the blossoms on this sage, it will know your socks off in person. This is my third favorite....no fourth favorite plant in Fred the garden this year. and I am not really fond of blue under most circumstances. Spring of last year I put in several plants and moved a couple of others around to better locations. Then the heatwave and drought hit and the water hose and I could not keep them alive. This past January, since we never really had winter, it was time to get out there, try to clean up and hope some of the perennials would come back. By March little clumps of green were showing up in all the right places....and there I am gazing in awe at the persistence of those tiny plants and wondering what they were. Some of the plant markers from the garden center had apparently dissolved in the heat since they were nowhere to be found. I dug out the extra tags I had kept since I had planted at least two of each kind and made the more durable markers from the CD cases. one of the two I thought were goldenrods has turned out to be a mini-coreopsis - only it is not so mini any more, almost 3 ft tall after being moved- I am pretty sure the other one is goldenrod since the leaves look right and one I tagged as a Purple Sage turned out to be a Mealy Sage. I have learned not to put as much trust into "oh, yeah, I can remember what that is" and write things down....just as an aide dontchaknow, I really have a very good memory.